No, this bird is not cracking up over your 8PM terrace jokes, exchanged with your friends over a glass of poncha. Similarly, this sound resembling that of a laughing frog (it’s the best comparison that came to my mind). For the locals, it comes from a Cagarro (ka-GAR-oh). 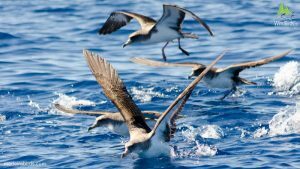 In English, the sound comes from Cory’s Shearwater birds: the largest shearwater and seabird that breeds on the Madeira archipelago. Hence, you will notice their cackling call immediately. The Selvagens (Savage) islands, which belong to the archipelago, are where the birds are most present. The biggest number of birds per square meter is recorded on those Savage Islands. It is because of their very noticeable presence that this region became an interesting hunting area at the end of the 19th century. Fortunately, the hunting expeditions ended towards the end of the 20th century, to the greatest misfortune of pillow- and comforter-stuffing workers. Its conservation status is now no cause for concern. 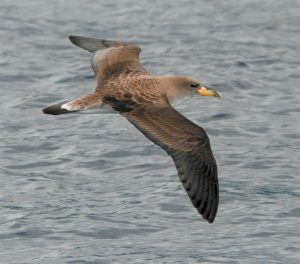 Cory’s Shearwaters (Calonectris borealis) can be observed in the warm waters of the Atlantic Ocean. This explains why Madeira is their place of residence during breeding season. Furthermore, their one-egg nests are on open ground or between rocks. 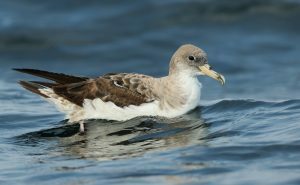 In order to avoid exposure to predator gulls, Cory’s Shearwaters are most active around the nest at night. They tend to stay near the sea cliffs, close to the ocean. This allows them to have easy access to crustaceans and fish, representing their main diet. They can dive up to 15 meters deep to catch food!